Danielle is a user experience researcher with a background in visualization and developing virtual environments. She holds a Bachelors of Science in visualization in digital media and a Masters of Science in Engineering Technology from East Tennessee State University. Danielle has a PhD in Human Environmental Sciences from the Architectural Studies Design with Digital Media program at the University of Missouri. She held a 4-year joint post-doctoral research scholar appointment at Penn State University with the Stuckeman Center for Design Computing in Architecture and ChoroPhronesis in Geography. 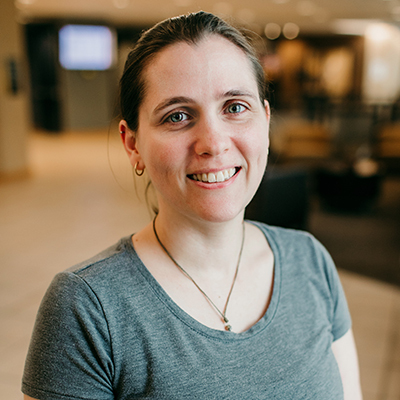 Her research focuses on understanding the role of immersion in comprehending virtual space as a means to transfer knowledge to a number of applications include learning spatial concepts, decision-making, and design. She has experience in developing learning environments, including her experience working with the iSocial project, on different gaming platforms and works with different virtual and augmented reality technology. She currently works in researching the value of creating and using virtual field trips as a means to supplement both the traditional and the online classroom through situated exploratory learning and decision-making.